This entry was posted on December 29, 2013. Join Sustainable Cycles for a week of workshops from January 7-10, ending with an open tent event on January 11 to celebrate, discuss, and enjoy one another’s company after a great week together. Workshop begins with a puppet show engaging with topics such as consent and the broad range of bodies we live in to open a dialogue. From the depths of the forests, a little creature calls to the moon for advice. This little friend’s quest for open and honest relationships based on respect might challenge us all! Jana is a witchy weirdo who spends her time with plants and forest children. She is passionate about creating new ways to relate to the world within and around us- one based on consent, not coercion. Participants will have the opportunity to sew their own reusable cloth menstrual pad. A valuable skill and design to serve you well in the future, hand sewn menstrual pads can make bleeding a more personally aware process. All materials will be provided. Explore the costs of disposable menstrual products and discuss the benefits of reusable. We will discuss some of the more sustainable options available on the market. Explore the world of cycle charting for fertility and body awareness. By charting the changes that take place throughout your cycle, you can gain a better understanding of when you are are most fertile, and when you can expect to menstruate. This workshop will discuss the use of herbs and whole foods to support the menstrual cycle. Plant allies like Red Raspberry, Stinging Nettle, Arnica, St. John’s Wort and Cayenne peppers will be explored. We will prepare nourishing herbal infusions and discuss how food affects the cycle. There will be the option of making a soothing salve to ease cramps, and a tincture to ease anxiety, stress, and hormonal imbalance. *Please note that it is recommended that you always check with your health care professionals before taking any herbal supplements or remedies, to prevent medication interactions. Sustainable Cycles is not to be held responsible for any reactions, interactions, or health issues resulting from the suggestions given. Information provided in this workshop is meant for educational purposes only. Our own unique stories of and relationships to menstruation are formed through our unique experiences of cycles and how the world around us interacts with menstruation. 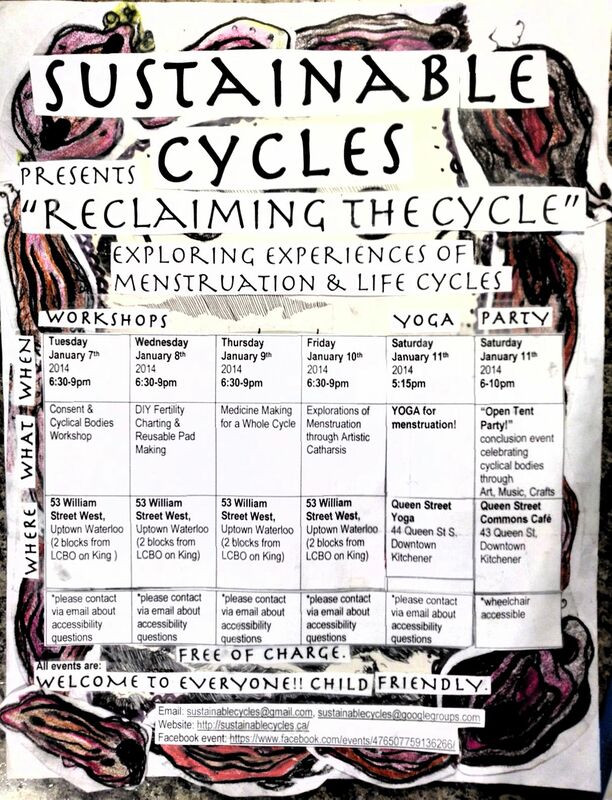 Lauren will lead the Co-creation of a safe space with workshop participants to open to exploring our whole human experiences of menstruation and life cycles on a personal level, and with relation to the world around us. We will explore tools such as meditation, writing, dance, drawing, poetry, vocalization, and instrumentation to delve deeper into our feelings and experiences. An opportunity for reflection, and sharing aim to create a space that is inspiring and empowering. Bringing awareness to our experiences in a supportive space, so that we may act in co-creation with culture shifting ideas of menstruation. Visit friends of Sustainable Cycles at Queen Street Yoga (44 Queen St. S, across from the Queen Street Commons Cafe) for a PWYC yoga class by donation. Warm up with some yoga before you come across the street to the Commons to celebrate with us! After a week of workshops, discussion and great company, come join us at the Queen Street Commons in downtown Kitchener to finish up the week in style! We’ll have snacks, zines, music, poetry, art and info tables. *All workshops will take place at 53 William St W, Waterloo. A cozy home atmosphere 2 blocks behind the LCBO in Uptown Waterloo, accessible by bus route #7. **Conclusion event on January 11 takes place at the Queen Street Commons Cafe, 43 Queen St S in downtown Kitchener, one block from the bus terminal. Note that everyone is welcome. Our events are not exclusive to menstruating individuals. Children are welcome at all events. Admission to all events is free, however donations are welcome to help support Sustainable Cycles. This entry was posted on December 11, 2013. 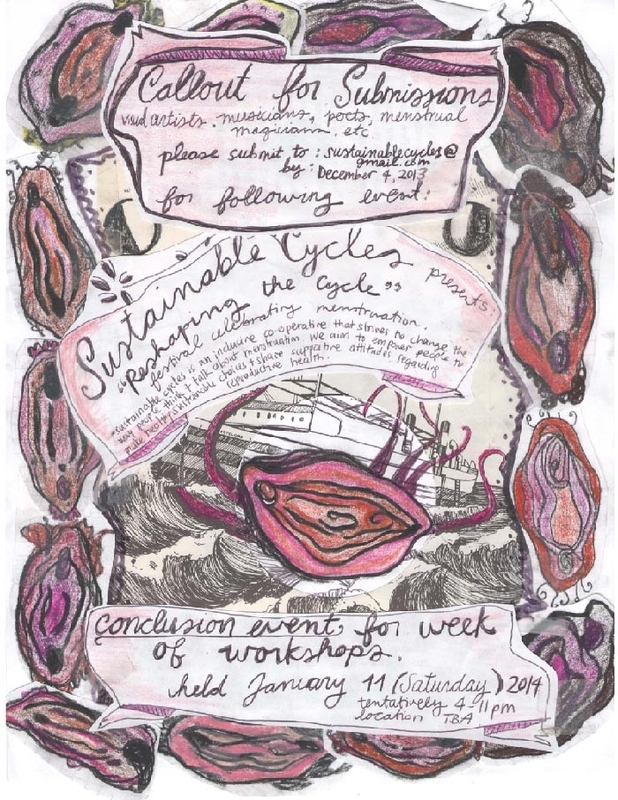 Sustainable Cycles is happy to announce that we will be hosting a week of workshops in January 2014. Check back here in the next few weeks for workshop specifics as our plans unfold. On the evening of Saturday, January 11 we will be hosting an open tent event in Kitchener to conclude our week of workshops. For this special conclusion event, we are reaching out to our community to share your talents and help make this event spectacular. We are looking for musicians, poets, visual artists, zine makers, artisans and any other creative individuals enthusiastic to contribute. If you’ve got a creative side that you’d love to share with us, send us an email at sustainablecycles@gmail.com with a description of what you can contribute. We will be accepting submissions until December 11. This entry was posted on December 4, 2013. This entry was posted on July 25, 2013. This entry was posted on January 2, 2013.